Spoilsport departs from Cairns, the only place in the world where two World Heritage-listed sites – the Great Barrier Reef and the Wet Tropics Rainforest – lie side by side. Within two hours you can be in the middle of the Great Barrier Reef, the expansive desert outback or a 110 million year old rainforest. It’s a beautiful part of the world so while you’re here why not take some time to explore the area. Mike Ball Dive Expeditions has preferred rates with a selection of hotels to suit a range of budgets and tastes. So if you need somewhere to stay before or after your expedition, have a look through the options available. 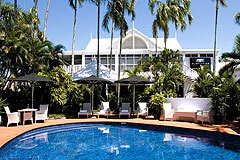 Cairns is Australia’s best ballooning location with over 300 days of sunshine every year. Take off at dawn for a flight over the Atherton Tablelands and the picturesque Mareeba Valley. Raft through World-Heritage listed rainforest on the Tully River or experience the Barron Gorge on a half-day Barron River Rafting adventure. Tours cater to people of all experience levels. An immersive experience where you’ll see, hear, smell and become part of the tropical rainforest environment. Glide above the canopy in comfortable six-person gondola cabins over a line 7.5km long with two rainforest stops along the way. Hop aboard this historic train on a slow and winding route through the rainforest from Cairns to Kuranda. The journey passes spectacular waterfalls and the stunning Barron Gorge. A stunning World Heritage area, the Daintree Forest is the largest area of tropical rainforest in Australia. It is rich with life with one hectare containing around 30,000 different species of plants, reptiles, mammals, birds and insects. About 1.5hrs from Cairns you hit the fringes of the vast Outback. Famous for its wide open spaces, blue skies and red earth, there is plenty to explore here including rugged ranges, underground lava tubes and wildlife. Visit for one or two days, or even longer. Gain a deeper understanding of Australia’s diverse Aboriginal heritage with a visit to Tjapukai. Get involved with interactive demonstrations of bush foods & medicine, spear and boomerang throwing, didgeridoo playing or sit back and watch a theatrical cultural show.